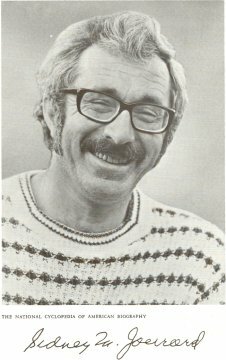 Sidney Marshall Jourard (1926--1974) was a leading force in Humanistic Psychology, and a pioneer in the fields of self-disclosure and body-awareness. Sidney was born in Canada and educated at the University of Toronto, where he took his M.A. degree in 1948. He continued his studies at the University of Buffalo (now State University of New York at Buffalo), and obtained his Ph.D. in clinical psychology in 1953. Dr. Jourard taught at Emory University and at the University of Alabama Medical College prior to joining the University of Florida in 1958, where he held the rank of Professor until his death in 1974. He was involved in private practice of individual psychotherapy for twenty-five years; and for the last ten years of his life conducted encounter groups, experiential seminars, and workshops for Esalen Institute, Kairos, Oasis, The Center of Man, and other growth centers about the United States, Canada and Europe. He was a Past President of the Association for Humanistic Psychology and the author of Personal Adjustment (1958-1963)The Transparent Self (1964-71), Disclosing Man to Himself (1968); Self-Disclosure (1971), and Healthy Personality (1974). Sid was ahead of his time in many areas of research. He was fascinated with human behavior from an early age, making him a sort of "natural" psychologist well before he received formal college and graduate instruction. He was intellectually curious and liked to play with ideas. Thirty-six years after his death, Sid's work has a surprising presence on the Web. His work is cited in a variety of websites, both in passing and in the form of direct quotes from his writings.This would have amused but not surprised Sid, who had a desire to leave a lasting mark on the world, and who was widely known and celebrated during his lifetime as an author, psychotherapist, lecturer and professor. Here is a one hour lecture delivered by Sid December 2, 1971 at the University of South Dakota in Vermillion, SD. Here are letters written to Sid by Carl Rogers, Abraham Maslow, Gordon Allport and Thomas Szasz.